Following the release of the new “pinching hand” emoji, an additional emoji has been released to meet the needs of the highest office in the land. “We would be derelict in our duty if we didn’t release a special “pinching tiny hand” emoji given what a fan of using twitter the President is. As has been the trend in this more woke time, the original pinching hand emoji is available in a range of different skin tones, though the newest release is so far only available in one color. Those who find the pinching hand emoji inadequate to fully express the smallness they are after are encouraged to use the pinching tiny hand emoji instead. 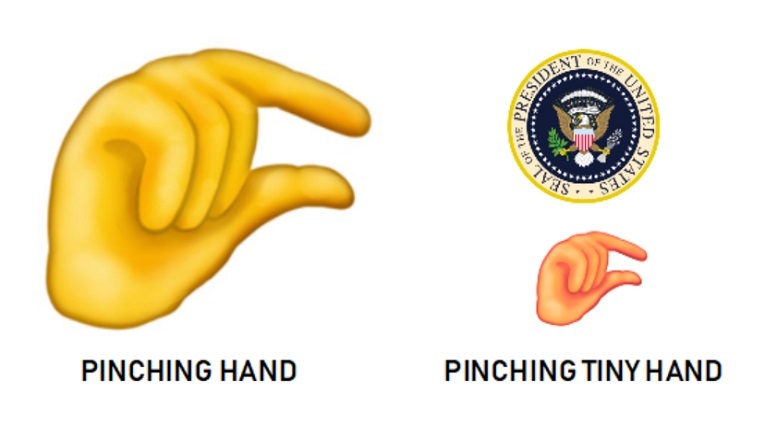 Be the first to comment on "Additional Pinching Tiny Hand Emoji Introduced For Use By President"